Be it a spontaneous romantic getaway for two, a group of friends exploring France together or a family friendly summer holiday in the Dordogne, we have the perfect self catering villa for you.. 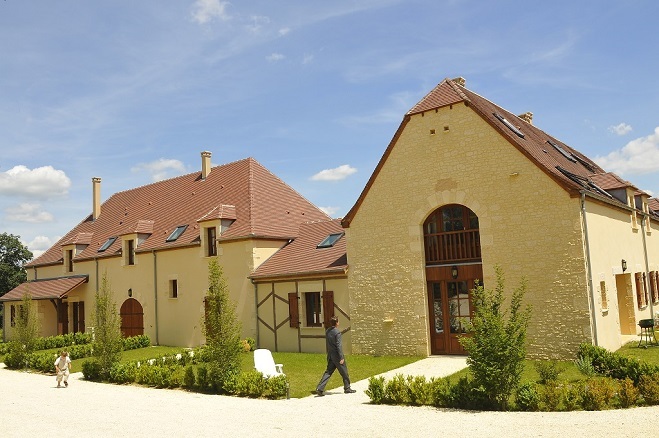 Thinking of a French self catering holiday but worried that you don't speak the language? With onsite management you need not hesitate as we'll advise and book tours/outings/sites/activities and restaurants for you! All you need to do is relax and enjoy your French experience! Come, explore, and be captivated by ‘La Vie en Rose’-stay in one of our beautiful elegant courtyard villas in the Dordogne, Nouvelle Aquitaine, and enjoy the holiday of your dreams. Drive up the wood lined driveway, past 'La Récré Gourmande' restaurant, and arrive at the splendour of our luxury self catering villas. The tranquil setting of ancient trees and mature gardens provide a heavenly backdrop for elegant living.. These wonderfully accommodating and beautifully crafted purpose built courtyard villas provide the space and comfort you need for a truly wonderful holiday. Each villa is unique in design and has been tastefully furnished to provide a delightful and elegant home from home in which to relax and unwind for your holiday. The facilities of 'La Recre Gourmande' Restaurant & Bar are on your doorstep with warm & welcoming staff on hand to make your evening a perfect one. Or alternatively, you can take the short stroll into the village where there are an abundance of fabulous restaurants and bistros that await you! Watch the sun set as you sip locally produced wine on your private terrace , enjoy a delicious meal in the beautiful restaurant, or simply get carried away with a good book as you relax in one of the shady corners-our rentals have it all! Complete your day exploring the many picturesque villages, ancient chateaux and bustling lively markets with a relaxing BBQ 'chez vous' or a delightful riverside meal in the village - the choice is yours! Come relax, unwind and enjoy.... our warm welcome will make you feel truly on holiday..